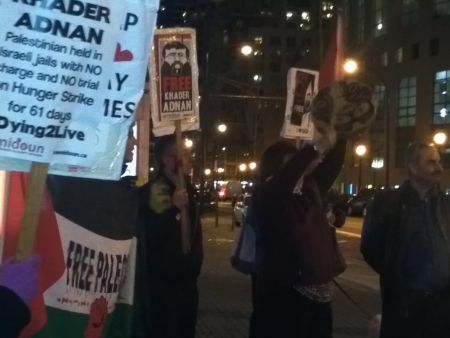 As Khader Adnan, Palestinian political prisoner, entered his 61st day of hunger strike, Vancouver Palestine activists held a vigil and picket at the CBC building in downtown Vancouver, calling for CBC to end its silence about his case. 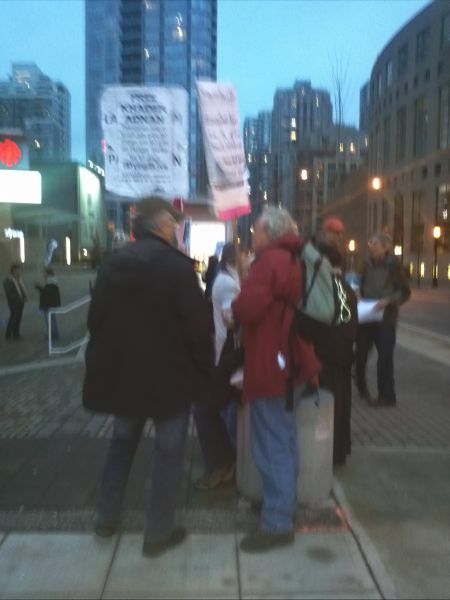 "Khader Adnan is invisible in Canadian media. We see John Baird saying that Israel has no greater friend than Canada, at a time when Khader Adnan is protesting his arbitrary detention without charge, settlements are expanding and the illegal occupation continues," said Khaled Barakat, Palestinian community activist. "We think it is very important to say that Baird does not speak for all Canadians." Activists from a number of Vancouver-based organizations, including the Boycott Israeli Apartheid Campaign, Canada Palestine Association, Canadian Boat to Gaza, Independent Jewish Voices, Seriously Free Speech, Samidoun Palestinian Prisoner Solidarity Network and others joined the picket, where protesters distributed flyers informing the public about Khader Adnan's case, held signs with his image and candles honoring his struggle and sacrifice. Khader Adnan is a Palestinian political activist, baker, husband and father who is being held in administrative detention by the Israeli occupation military forces. Administrative detention is detention without charge, based only on secret evidence, indefinitely renewable by military judges. Amnesty International and Human Rights Watch have called for Khader Adnan to be charged or released. Thousands of people around the world have called for his release. In Palestine, dozens have been injured as protests calling for his release were attacked with tear gas and rubber bullets. Despite these calls, an Israeli military appeal upheld Khader’s administrative detention on Monday. He has still not been – and will not be – charged with any crime. Khader Adnan is demanding the end of administrative detention in Palestine. Past the fiftieth day, hunger strikers are in severe danger of organ failure and death. Despite urging from lawyers and family members, Khader Adnan insists upon continuing his hunger strike. His family have called for international support, and today's protest took place as part of that call. 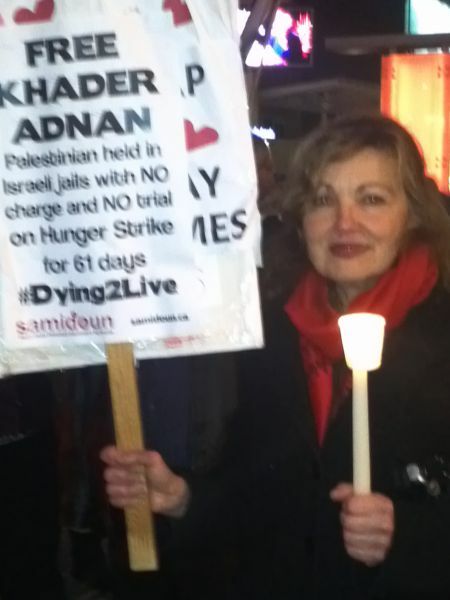 Randa Adnan, Khader's wife, said: “My husband is dying inside an Israeli jail. The world should make sure I am able to see him,” she said. “And it should pressure the Israeli government to release him before it’s too late… Israel denied Khader any fairness or decency…But maybe the rest of humanity will show more mercy."